Gilsum Rock Swap & Mineral Show! The 55th annual Gilsum Rock Swap & Mineral Show features more than 65 rock and gem dealers, swappers, and collectors from around the world offering beryl, quartz crystals, fossils, meteorites, semi-precious stones, gemstone and wire-wrap jewelry, and rocks and minerals of all sorts. Displays range from newly found specimens in the rough to fossils, prized collector’s pieces and hand-crafted jewelry. This family event includes panning for minerals, a chicken barbeque, ham and bean dinner with homemade pies and more. The event takes place at the Gilsum Elementary School grounds, 640 Route 10 in Gilsum, NH. We are 8 miles north of Keene, and about 2 hours from Boston. Admission is free. Show hours are 8:00 AM to 6:00 PM Saturday and 8:00 AM to 4:00 PM Sunday, rain or shine. 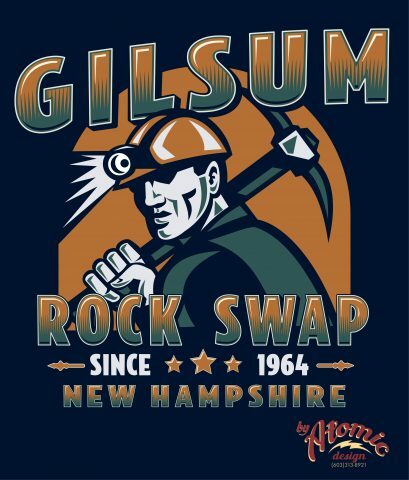 Gilsum, NH — The town of Gilsum, located in the scenic Monadnock Region in southwestern NH, will once again host thousands of people from all over the U.S. who will attend the Gilsum Rock Swap and Mineral Show. Here more than 65 dealers, swappers, distributors, wholesalers, and collectors can buy, sell, or swap beryl, quartz crystals, semi-precious stones, and rocks and minerals of all sorts. Displays range from newly found specimens in the rough to fossils, prized collector’s pieces and hand-crafted jewelry. The event takes place at the Gilsum Elementary School grounds, Route 10 in Gilsum, just north of Keene, NH, and is about 2 hours from Boston. Show hours are 8:00 AM to 6:00 PM Saturday and 8:00 AM to 4:00 PM Sunday. Mineral collector and geologist Nancy Swing returns again this year with an all-new presentation on Herkimer diamonds, how they form and where to find them in the Northeast. Join Nancy Saturday at 1:00 pm in the Gilsum Elementary School auditorium – and get a free specimen! Gilsum’s many mines operated until the 1940s and yielded feldspar, mica, and beryl. Most are now abandoned, although one, the Beauregard mine, is available to mineral clubs through prior arrangement. Today collectors prize other minerals such as beryl. Maps showing locations of local mines are available during the show. Since the show’s inception, the town of Gilsum has opened its doors for the event. Activities include a presentation on prospecting Saturday, daily pancake brunch, bake sale, book sale, a traditional Saturday night New England ham and bean supper with homemade pies and a chicken barbeque dinner Sunday afternoon. Admission is free, although donations are graciously accepted. All proceeds go to youth recreation and community programs. P.O. Box 76, Gilsum, NH, 03448; call 603-357-9636; or send e-mail to gilsumrocks@gmail.com. Orange County Mineral Society Show in June! 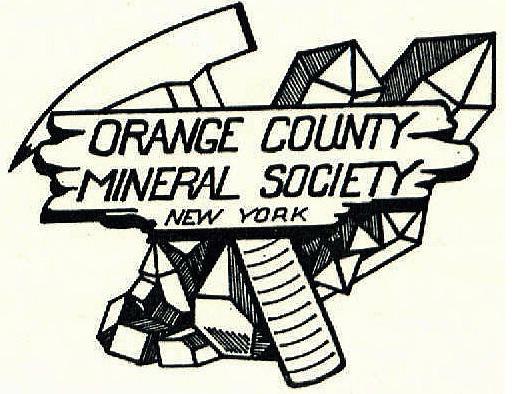 The Society maintains membership in the Eastern Federation of Mineralogical and Lapidary Sciences, Inc. which is affiliated with the American Federation of Mineralogical Societies, Inc. This affiliation provides the Society with the necessary insurances and up to date research materials. Meetings are held on the 2nd Friday of each month at 6:30 pm in the Holy Cross Greek Church, 2250 Goshen Turnpike, Middletown 1094, In the basement meeting room. If interested in learning more about the Society or becoming a member, please contact Mr. Mike Tedford 845-542-6441. Overview: The current Orange County Mineral Society has membership ranging from youngsters to senior citizens. All club members are encouraged to participate in all phases of club activities. The children especially like the field trips, and gain extensive knowledge from attending meetings and participating in the club activities. Each club meeting brings us new knowledge by the education provided by our guest speakers and by hands on experience for both young and old. Participation includes maintenance of the mineral displays for the County of Orange in the Natural History building in Museum Village, Monroe NY. Members may contribute articles for the monthly newsletter “Shale Mail”, and can cover any aspect of the earth sciences. We share knowledge and have available respected, knowledgeable individuals in our Mineral Group. 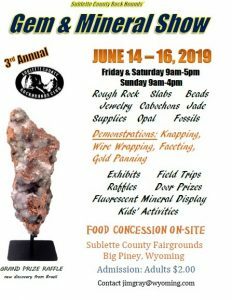 3rd Annual Gem & Mineral Show by the Sublette County Rockhounds. 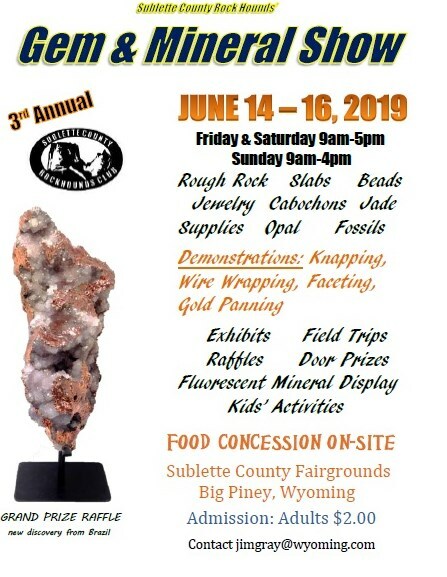 June 14-16, 2019 at the Sublette County Fairgrounds in the Event Center. Friday and Saturday 9am – 5pm, Sunday 9am-4pm. Admission, Adults $2.00, children under 18 free! For more information, contact subletterockhounds@wsmgs.org. 87 at mile marker 251, Payson AZ on the Tonto Apache Reservation. the higher and/or better education of our local students. If anyone has any questions they can call Becky Bagshaw at 928-476-3419. Kansas City Gem, Fossil, Mineral Show this weekend! The goals and purposes of the Association of Earth Science Clubs of Greater Kansas City are educational and scientific in nature. They are: to promote interest in geology and lapidary arts; to encourage the collecting and display of rocks, gems and minerals; to encourage field trips of a geological, mineralogical or lapidary nature; and to encourage greater public interest and education in gems and minerals. The clubs of the Association make donations to the Midwest Federation, the American Federation of Mineralogical Societies, and the Scholarship Fund. The Association has established its own scholarship fund and presents scholarships each semester to several college students. Our aim is to help deserving students further their education in the earth sciences. Various clubs members are available to present programs and lectures with slides to the public. Schools, youth groups are given special invitations and area teachers are given rocks and mineral specimen collections to teach and enjoy at their schools. The Association of Earth Science Clubs of Greater Kansas City members would like to thank you for attending our show. You have contributed to the achievement of our goals. 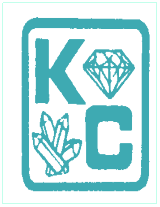 Our mineral show is held at the KCI Expo Center, 11730 NW Ambassador Dr. Kansas City, MO 64153. Take the 112th St. exit off I-29 and go to Ambassador and turn left. The building is approximately a half mile from the stop light on the left hand side of the road or take the KCI Exit (Cookingham Drive) off I-435. As always there was a wide variety of retail dealers selling a wonderful assortment of rocks and minerals, fossils, lapidary work, jewelry and gemstones, beads and beading supplies, and supplies…the list is just too long to cover completely! The wholesale area will be in operation where those with valid tax ID’s in the gem, mineral, beading, and jewelry trades can purchase products and supplies. This area closes one hour before the show ends. 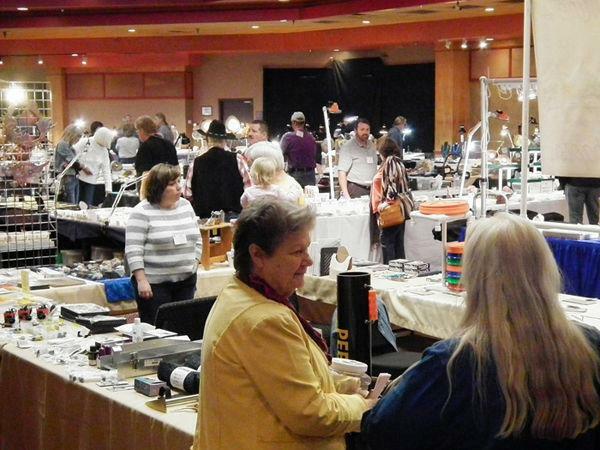 This mineral show is eagerly anticipated by thousands of area residents as one of the premier shows in the mid-west. Visitors will see special displays of rocks and minerals, lapidary work of all kinds, live demonstrations of lapidary, bead making and jewelry fabrication techniques. Static displays include fossils and fossil identification, club-member displays, and a special area for children. We also have a large non-retail swap area and special displays for schools. Friday is the day that educators and youth leaders bring their students and youth groups on field trips. Each day there will be lectures and slide presentations that visitors can attend. Valuable door prizes will be given away,all three day, to lucky show visitors. Saturday night, after the mineral show closes, a public auction of donated items from our retail and wholesale dealers will be held at 7:00 pm. On Saturday and Sunday afternoon several silent auctions will be held during the show, just behind the information booth. All auction proceeds go to the Association’s Scholarship Fund. Several scholarship recipients benefit from the proceeds of this year’s show auctions.